Do you have a great idea for a project or program in our region that could benefit from funding or support? Across our region, renewable energy developers are looking to invest in local projects and programs that have positive social, community economic and environmental impact. These companies are creating ‘shared value’ by addressing community needs in ways that improve their bottom line results. Shared value is defined as policies and practices that enhance the competitiveness of companies while improving local economic, social and environmental conditions in the regions where they operate. Through the Victorian Renewable Energy Auction Scheme, the State has made a compulsory requirement that all participants in the Auction Scheme must demonstrate shared value. The State has also recently released a guide for developers on community engagement and benefit sharing available here. 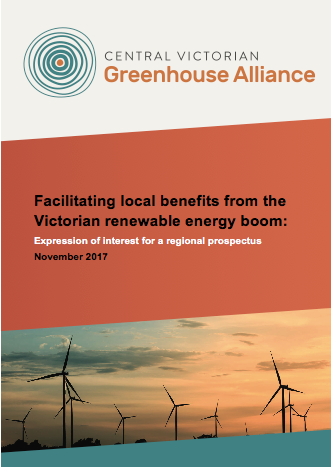 To assist the State and developers identify and connect to local projects, the Central Victorian Greenhouse Alliance and partnering local governments have prepared this Expression of Interest to capture local projects as investment opportunities to be communicated through a regional prospectus. Note that the CVGA will not have a role in selecting projects but is simply gathering a prospectus of potential projects that developers can then use to select from. The CVGA is not being funded by the developers or the State to deliver this, but is doing it for community benefit alone. Any type of organisation or individual is able to register their idea through this process. The key attribute will be about delivering local benefits to the region the developments occur within. For developers: If you are a renewable energy developer and would like to register your interest in this prospectus please send an email to comms@cvga.org.au and we will help facilitate connections.